Annelie acts a lot like the hilarious and rebellious red-pigtailed Swede, Miss Pippilotta Delicatessa Windowshade Mackrelmint Ephraim's Daughter Longstocking. She loved when we read the book together last spring, so it's no surprise that she wanted to make herself a shoulder-sitting Mr. Nilsson to go with the Pippi costume she can't wait to wear for Halloween this year. Giving my kids glue gun privileges just might be the biggest mistake I've ever made - potentially worse than scissor privileges, which led to years of crazy-cut hair. I've already peeled quite a bit of melted glue off my floors. But I'm a glutton for punishment, raising two craft junkies. Some things can't be helped. Annelie raided my felt and fleece stash, and I helped her cut out a monkey shape to glue and stuff. 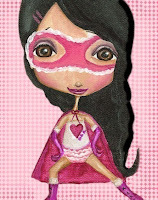 I cut out the nose and eyes to her specifications, and helped a bit with the face-gluing... but she did the rest! I think they make the perfect duo. They even look alike. Happy Friday, folks! Hope you have a great weekend! I'm not gonna lie - I was VERY nervous about Annelie starting kindergarten. When it comes to temperament, she's an extreme version of myself, and by the time I was her age, I'd been in the principal's office more times than I could count - AND one of those times was to inform me that my 5-year-old bestie wasn't allowed to play with me anymore, because her mother thought I was too horrible and therefore a terrible influence on her daughter. Yep, I was very, very nervous about Annelie starting kindergarten. 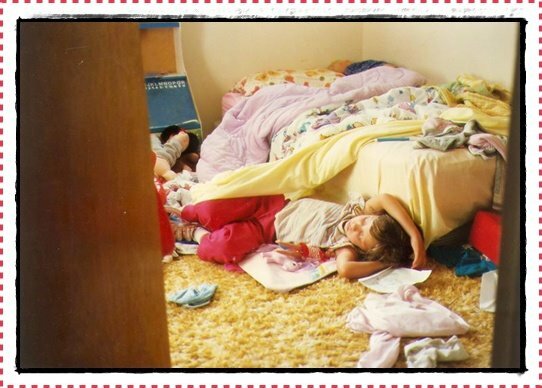 I expected to hear the phone ringing non-stop, with frantic calls from her teacher begging me to homeschool. When the first day of school came around and Annelie's (totally adorable and super sweet) teacher sent home a 3-page packet filled with All About Your Kid questions - words to describe kiddo, favorite things, as well as my favorite question: What would you like me to know about your child? - I was THRILLED. A chance to explain Annelie, before the teacher even got to know her?!!! It was a mother-of-a-very-smart-but-VERY-moody-and-often-problematic-child's dream. But... when it came to filling out the form, I decided to skip the disclaimer and let Annelie explain herself. Sure, I put in the words to describe her, as asked (vivacious, friendly, giving - because it's true - she is definitely all of these things). But when it came to Things To Know About Annelie, I left it at, "Avoid giving her red dye 40 as it can bring on potentially vicious mood swings." I bit my nails as I put the 3-page paper in Annelie's folder to take to school, wondering if I should have written more. I bit my nails worse when Annelie came home boasting about the red and orange M&Ms she ate at school. And wouldn't you know it, my kiddo was one of the fifteen students (out of 600!!!) picked as an All Star - an example to the rest of the students at her school for having exemplary behavior, making good choices, and being a great friend to everyone. The reward - a lunchtime bus ride over to the pizza place and arcade, to celebrate with the other All Stars, and their parents. We had a great lunch. I'm so proud of my kiddo! Proud of BOTH my kiddos - as Gracie won this same award in her first six weeks of kindergarten, too - and has kept up her All Star awesome behavior ever since. I guess sometimes it takes letting them out of our eyesight in order to watch them bloom. Annelie loves coming up with creative, if not torturous, methods of pulling out her teeth. Her first wiggly top tooth was no exception. It hung halfway out for a day before she decided enough was enough - she wanted it out, and she wanted it out by way of string-tied-to-tooth-and-door. Horrible, I know. Although, my grandma did this to me, once, when I was about Annelie's age (5), and though I can still remember the shock I felt as the tooth was pulled, it's overshadowed by my childish glee. I captured Annelie's tooth removal on film and am just as gleeful now as I was twenty-odd years ago. She couldn't wait to put her tooth under her pillow, and go to sleep, waking up to a pile of money. I was excited for her, too. Except... I went to bed and forgot one little thing. And when I woke her up yesterday morning and saw her stick her hand under her pillow to see how much the tooth fairy left her, my stomach fell as fast as her face. Oh man, she cried and cried and it was terrible. Will insisted that this happened to him once, too, but the tooth fairy doubled his money the next night and that was the best. She sniffled and wiped her eyes and I stuck a sticker on each of her hands to help her feel better (stickers are amazing like that). But I felt awful. Boooooooo. Luckily I have some awesomely creative friends, such as Anne, from Luvaloo, and Craft Gossip, who said "I think there might have been a little girl who didn't believe in the tooth fairy, so she set a trap to catch her. The poor thing spent the whole night under an upturned glass jar." Oh, Anne, you are brilliant. However, last night, I was all set to sleep when Will said, "The Tooth Fairy gave Annelie some money, right?" My mom used to threaten to staple reminders to my forehead when I was a kid (jokingly), and I can understand why. Yay for Daddy, who saved the day! When I went to wake up my hard-to-wake child for school this morning, she was already up, coins in hand, squealing over her loot (which included the tooth, because the Tooth Fairy couldn't find it under her pillow). "YAY, and she even let me keep my tooth!" Annelie exclaimed, proudly displaying it on her shelf (ew). Our tooth fairies always leave notes, and come with an assortment of names. It was Lola (one of Gracie's fairy visitors) who wrote last night's note, visiting all the way from England, where she was trapped by a horrid little girl, and saved by the playful cat, who broke the trap - such a hero. Lola apologized to Annelie, and gave her extra coins - including the pound coin she did NOT give to the horrid fairy-trapping girl, much to Annelie's delight. My secret drawer of random things contained a fairy-sized dollhouse craft, and Lola added it to the package, which Annelie loved even more than her handful of coins. Poor Gracie. She was so jealous - and now wishes Lola will pull a no-show on her some day. With me as a mom, it is very likely this will happen. 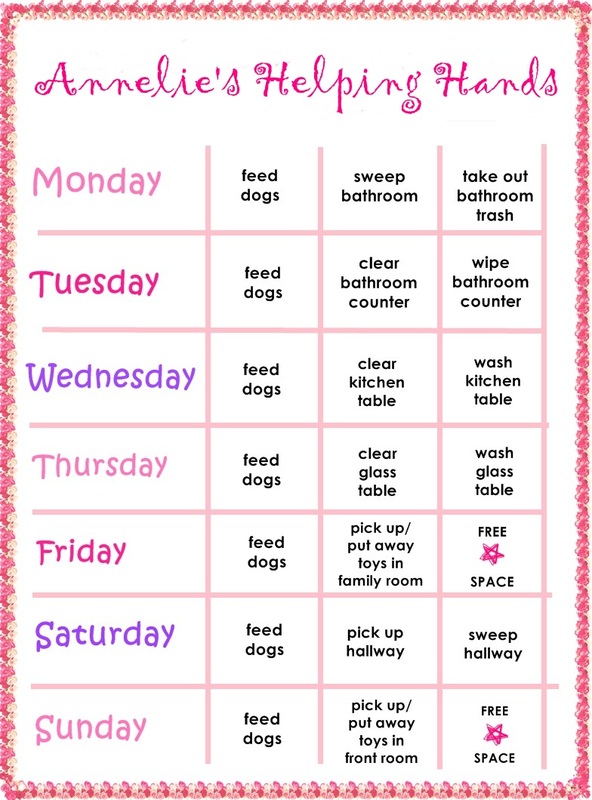 I've been meaning to do this post for about 6 months, when I was asked to share how I do chore time in our family. So... a little belated, but here we go. (There are other photos in this collection. 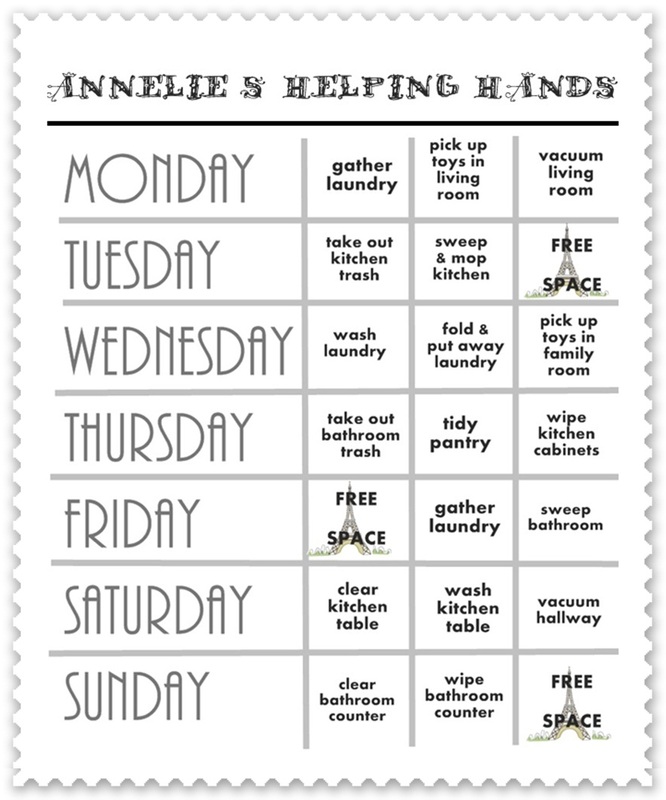 Well, I wasn't about to let my kids live their life without a heavy duty list of chores. Not so much because I want to instill a belief that this house is mine AND theirs to take care of, but because if I delegate all my least favorite chores, then my life is happier. The instilling a belief that this house is mine AND theirs to take care of is just a bonus. A handful of months later, I called the kids for a family meeting, and congratulated and thanked them for their jobs well done. Then I gave them their very first Helping Hands charts, which were decorated with a pretty flower border and featured many shades of pink. THE RULE: do the chores at 4 o'clock (which I call '4 o'clock, chore o'clock'). 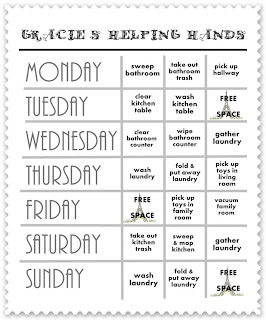 If the week's chores are done without complaining, the kids get $2. If they complain, they don't get anything and still have to do the chores. They love options and I thought these options were pretty fair. 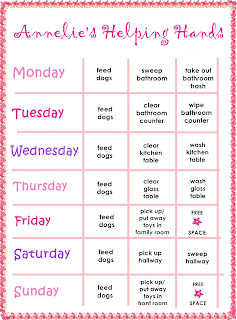 Well, these chore charts have lasted a whole 6 months and let me tell ya, my kids are SO GREAT at doing each one of these chores because they've had so much practice. They've also learned that if they do the chores fast, they get more playtime. If they do them fast but are too sloppy, they have to do them again. Gracie flipped out over the fun text and Eiffel Towers. Honestly, it is THAT easy to get her excited about a Helping Hands chart. And that's that. 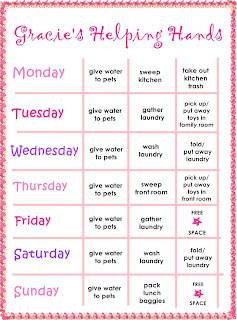 My kids do their chores at chore o'clock, every day. And my life is much happier. 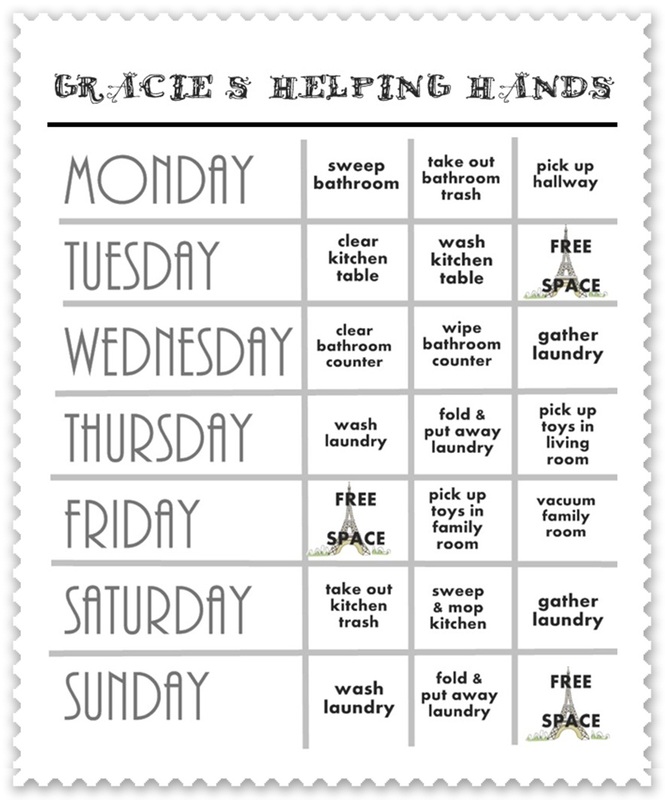 UPDATE - I saw this post on Money Saving Mom: 20 Chore Ideas for 7-year-olds (and there is one for 4-year-olds, too) and it sounds a lot like how it's done at my house - much praise, assistance on certain chores (laundry, etc), and patience when it comes to kids meeting expectations. My kids have been folding laundry since they were four, and at first were so sloppy, but I repressed the compulsion to do it myself, and now they are pros. It's wonderful. 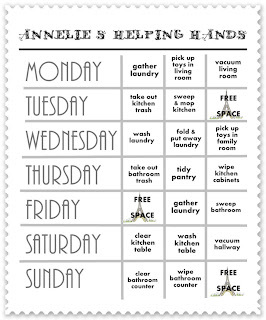 Do those of you with kids dole out household chores? 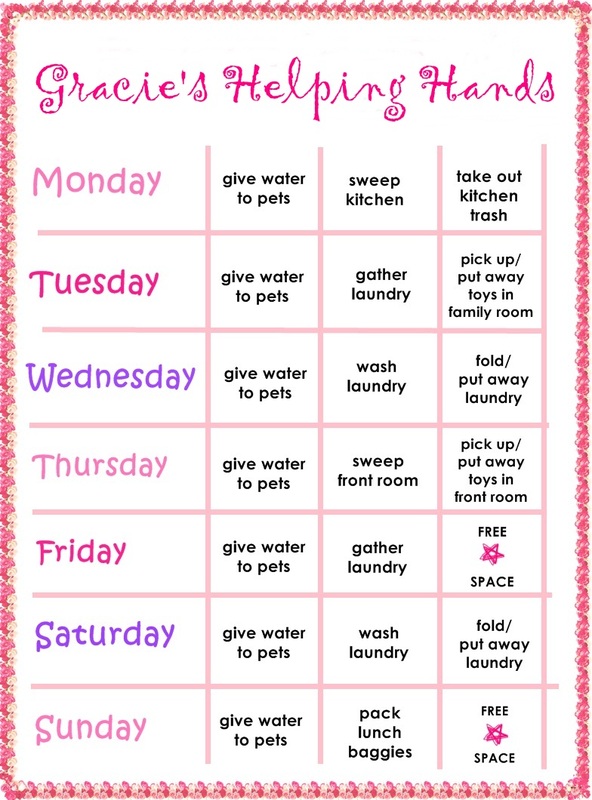 If so, what chores! I'm both curious and eager to delegate new responsibilities, so please tell me!